[0:03] <teclo-> I'm looking for small raspberry pi stickers to put on SD cards... I've found this: http://www.ebay.co.uk/itm/STICKERS-SML-10-Raspberry-Pi-Stickers-Raspberry-Pi-Small-10-Pack-/141331071969? ... isn't 7,39 plus 3,99 GBP a lot of 10 small stickers ? [0:05] <IT_Sean> That's just over £1 per sticker. [0:05] <willmore> Yes, that is expensive. [0:05] <thescatman_> just print some out and use glue? [0:06] <IT_Sean> But, not horrible. [0:06] <Stephini> have you thought about getting labels printed at your local kinkos? [0:07] <Stephini> IT_Sean, 20 bucks for 10 thumbnail sized stickers is not just steep. that's outrageous. you can kinkos or redbubble that much sticker material for like 2 bucks. [0:07] <IT_Sean> Then do it. [0:12] <Stephini> teclo-, why not? get a square or rectangle die of the apropriate size and some edgeless label paper in your choice of matte or glossy laser paper? [0:13] <Stephini> it'll cost about 5 for the die and 10 for the reem of paper. but you'll be able to print thousands of stickers that way. also make sure to not pusht eh die all the way down if you want that proffesional perferated effect ont eh stickers. [0:16] <Stephini> teclo-, ah that's why i use dies. i can just punch out the sticker size i want. failing that a strait edge and exacto knife are pretty decent. [0:21] <johntramp> hi, I am wanting to have a bunch of pies which are on the same lan with the same sd image. I thought to identify which is which they could each have a jumper on different pairs of pins on the gpio header which would be read at boot and used to set the hostname. is this reasonable? [0:27] <PovAddict> but it may be a bit heavy for the Pi? [0:27] <shiftplusone> there are quite a few flexible 'tiling' windows managers which can probably be configured the way you want. [0:27] <WACOMalt> PovAddict, it may be. alternatively... is there a way to have multiple different "Displays" ? [0:28] <shiftplusone> yes, run X multiple times. [0:28] <WACOMalt> and it will just be a new display? [0:29] <shiftplusone> PovAddict, DISPLAY will already be set correctly within X, it's only if he's launching the application from a different VT that he'll need to worry about it. [0:32] <PovAddict> johntramp: do you have a DNS server? [0:38] <movic> I'm getting this error: Restarting bittorrent daemon: transmission-daemon[00:38:38.700] JSON parser failed in /var/lib/transmission-daemon/info/settings.json at line 70, column 5: ""watch-dir": "/h"
[0:59] <movic> is there any way to change it? [0:59] <Steve_Jobs> what's the best way to check of a value changed on the gpio pins from bash? [0:59] <Triffid_Hunter> movic: why do you want to change the mac address? [0:59] <movic> Triffid_Hunter: not the mac, but the "name"
[1:03] <movic> Triffid_Hunter: do you know whats the name of the file? [1:11] <WACOMalt> This bake sense? [1:13] <Arbition> You're running multiple X sessions? Are you sure you have the memory headroom to do that? [1:14] <Arbition> Any particular reason why you couldn't use a tiling window manager with workspaces instead? [1:15] <WACOMalt> But am I doing my potentially bad idea the right way? [1:16] <WACOMalt> OK this works now. [1:24] <Triffid_Hunter> WACOMalt: why does signing in on TTY2 close everything? [1:28] <Triffid_Hunter> WACOMalt: linux in a VM on your desktop? [1:45] <Steve_Jobs> Sonny_Jim: my google foo is failing today then..
[1:50] <niston> why do you think the card is corrupt ? [1:50] <niston> did you try editing the config.txt ? [1:54] <Sonny_Jim> What does the bash script do? [1:56] <Sonny_Jim> Have you had a look at this script? [1:56] <Sonny_Jim> Do you know any C? [2:10] <Steve_Jobs> ugh.. so the pins on that board don't have a true linux driver? [2:11] <Steve_Jobs> Sonny_Jim: how does it compare to a keyboard driver? [2:20] <WACOMalt> Anyone know what this means? [2:42] <Sonny_Jim> Isn't there an easy to use wireless configurator in the Rasbian desktop? [2:45] <McBride36> when entering information? [2:45] <McBride36> or during installation? [2:49] <WACOMalt> So... is there a way for me to run a disk check/repair on my sd card? or am I borked? [2:50] <Triffid_Hunter> WACOMalt: eh, what did you do to it? [2:52] <WACOMalt> even considering it booted fine after using windows? [2:54] <Triffid_Hunter> WACOMalt: why is it mounting an image then switching root in the first place? [2:55] <WACOMalt> any way I can pull the compiled ffmeg out and use that if I rewrite raspbian? [2:57] <seitensei> WACOMalt: have you considered cross-compiling? [2:59] <seitensei> WACOMalt: Can you virtualize linux? [3:00] <steve_rox> quick question, is there test points on rpi2? [3:06] <ball> I have plans for mine ...when I can find it. [3:07] <seitensei> steve_rox: Are you on power supply or usb? [3:10] <[Saint]> NZ Customs let me bring in a _reaaaaaaally_ scary 'laser pointer'. [3:10] <steve_rox> does it mean anything in perticular if both LED on the rpi2 are off? [3:11] <WACOMalt> Hey, anyone have any ideas why this "profile" file wouldnt be finishing up in TTY7 ? [3:12] <steve_rox> how many amps for rpi2? [3:12] <[Saint]> It sets fire to stuff from across the room. [3:13] <[Saint]> Pops baloons, puts pinpoint holes in the wall, casts a beam up into the night sky that's visible beyong my depth of vision...etc. [3:13] <[Saint]> sets fire to paper. Melts plastic. [3:13] <[Saint]> Absolutely _will_ blind you if you point it in your eye. [3:14] <[Saint]> This thing looks like a light sabre. [3:15] <niston> is there accessories to be had for it? [3:15] <[Saint]> The beam is tiny, the batteries and the focal lenses however, are huge. [3:15] <niston> like flashlight addon? [3:15] <niston> phosphorous that turns the laser into white light? [3:15] <[Saint]> Not this one at least. [3:16] <[Saint]> When I power it on it makes a really satisfying "BweeeeeeeeeeeeeeeEEEEEEEEEEEEEEEEEE!" noise for about two minutes while it charges up its caps. [3:17] <[Saint]> NZ Customs had precisely zero issues with that. And I know damn well they opened the box and had a good 'ol nosey around. [3:17] <[Saint]> But I tried bringing in a half car for the fron t end and engine from Japand, and, nope...leaves. LEAVES! [3:20] <WACOMalt> can anyone tell me if I'm maybe using the chvt command wrong? [3:21] <[Saint]> Its a good thing it came with a (mostly) discharged battery, focal lenses disassembled, and partially disassembled itself. [3:21] <[Saint]> 'cos I can just imagine one of the Customs agents being all like "Hurr Durr - I wonder how bright this flashlight isd...Hurr Durr"
[3:25] <[Saint]> One of the review comments says that the dude got one as a toy for his cats. [3:26] <[Saint]> Funny thing is, when I got it, there was a dead frog in the window washer container, no one cared about that. [3:26] <[Saint]> And I found a bunch more leaves. [3:26] <niston> leaves are deadly weapons of mass destruction didnt you know? [3:26] <[Saint]> I think they just tried, and succeeded, to shaft me. [3:28] <niston> plugwash they should then close down all harbors because ships usually carry a lot of "foreign biological material" on their hulls. [3:29] <steve_rox> so yeah anyone know how many amps rpi 2 needs? [3:32] <plugwash> and the makers optimistically label them as "5V 2A"
[3:32] <WACOMalt> the resolution is wrong. [3:33] <WACOMalt> what is xrandr? [3:34] <ball> Does xrandr use 2D hardware, where present? [3:35] <ball> Triffid_Hunter: So it depends whether Xorg includes support for the 2D hardware? [3:35] <WACOMalt> so... what is actually in control of rendering the full resolution to my full screen? [3:36] <WACOMalt> is that X? [3:37] <WACOMalt> I boot to console, then I run "X"
[3:38] <ball> Useful to know, thanks. [3:40] <WACOMalt> when in console how can I scroll up to read output? [3:45] <Triffid_Hunter> WACOMalt: well if xrandr says it's set to 1920x1080, why do you think it's running at 1440x900? [3:46] <Triffid_Hunter> WACOMalt: so they're not taking up the whole screen? [5:16] <markfletcher> Hi, can anyone recommend a text editor for the raspi, that resembles sublime text, ie, has a folder / project view. ive tried geany but it doesnt do what I need. [5:21] <abnormal> oh, sorry... LIbreoffice? [5:21] <McBride36> markfletcher, just for text editing? [5:21] <McBride36> or like coding? [5:26] <McBride36> does pycharm work on pi? [5:32] <abnormal> why not just use Python? [5:35] <abnormal> can you load vim in pi? [5:37] <abnormal> so I have to do sudo cli? [5:43] <abnormal> good luck and have fun. [5:45] <abnormal> ok... just be sure to pay attention to your job first... don't want hear you getting fired for reading that. [6:02] <sidharthr> Hi everyone, Pi novice here. I was thinking of sending camera feed from the Pi to my laptop via WiFi, do some processing and send instructions back to the Pi. Any idea on how much the delay might be? [6:06] <sidharthr> Okay, so if I keep the laptop, router and Pi near each other (say less than 2 metres), then it should be okay? [6:08] <McBride36> have you found any example projects that do something similar? [6:21] <sidharthr> @McBride: Not yet. Still searching. [6:23] <sidharthr> One alternative would be to do the image processing + learning on the Pi2 itself. Would the Pi2 be able to handle that? [6:32] <SpeedEvil> Does it have huge limitations - yes. [6:34] <SpeedEvil> But define CPU heavy. [6:34] <SpeedEvil> Image processingmay not be it. [6:35] <SpeedEvil> 640*480*30 is only 9Mpixels/second. [6:37] <shiftplusone> The VPUs and QPUs are there if you're brainy enough to use them as well. [7:42] <shiftplusone> stellar_mind, people don't generally answer to roll calls, only actual questions. [7:44] <shiftplusone> For video encoding, there's a block that can compare frames to detect motion. [7:45] <shiftplusone> There was talk that instead of giving video output from what, we can give numerical values. [7:46] <shiftplusone> In the juggling example, you can see how it currently works. [7:48] <stellar_mind> Triffid_Hunter is there any resource to read up on that? I am quite a beginner in vision and video encoding. [7:48] <shiftplusone> I'm currently on holiday, but when I get back to the office, I can pitch your project as a reason to bring the raw numbers out. [7:51] <shiftplusone> Read the comments on that post.... some interesting stuff. [7:52] <PovAddict> what version of the pi? [7:52] <stellar_mind> yes. Going through it now, thanks. [7:53] <SpeedEvil> If the shuttlecock moves fast enough, it'll just be encoded as small still images, with no motion. [7:54] <shiftplusone> SpeedEvil, fair point. [7:54] <shiftplusone> Might be a question for Gordon or one of those people who actually know the full capabilities of the system. [7:55] <stellar_mind> SpeedEvil Hardly any useful results as of now. [7:56] <qubitnerd> is the compiler written by the argon people up somewhere ? or is it closed ? [7:57] <botnut> has anyone set up a pi as a wifi ap/router? if so - how hard was it? [7:57] <ppq> it's a bit tricky. [7:58] <botnut> was it worth it ? [8:01] <shiftplusone> stellar_mind, though I'll probably say that there are better solutions out there for you. The pi wasn't designed to do this and you need to be able to fill in the gaps yourself. While it would be awesome to see this done on the raspberry pi and it would go viral on sites like hackaday, it might not be the most practical if you don't want to spend a lot of time hacking around. [8:04] <stellar_mind> but yes. There is a time contraint here, will definitely have to look for alternatives. [8:04] <shiftplusone> how much time do you have and are you willing to risk ending up in a situation where you get close but find some limitations you can't work around to make this a viable system? [8:06] <stellar_mind> but anyway, do you guys think there could be an alternative to using vision? We are trying Sharp IR sensors as well for now. [8:10] <stellar_mind> whoa. Seems interesting. I wonder how no one in our team thought about this. [8:10] <botnut> is this for school? [8:11] <stellar_mind> Robocon, a pan asia Robotics competition for under-graduates. [8:12] <stellar_mind> thanks. Will check it out immediately. [8:16] <botnut> anyone try out picamera for streaming videos from the py over the net to a browser? [8:46] <Mikk36> how much total memory should i be seeing on the RPi2? [8:49] <Mikk36> so how am i missing roughly 200 MB? [8:50] <leio> Mikk36: Tere; how did you set the memory split? [8:50] <SpeedEvil> Mikk36: Some vendors hacksaw it off and sell it seperately. [8:52] <Mikk36> where is that file? [8:58] <leio> what's the 0x... for mem_size? [9:01] <Xark> Mikk36: There is a known issue that the kernel the Foundation ships "wastes" 256MB (due to 1G/3G user/kernel memory split). They did this because Sonic Pi has issues with 2G/2G split (however, I think rpi-update will give you all memory). [10:18] <MY123> Is there any good cases for the Pi2B? [10:20] * shiftplusone stops shilling for pimoroni. [10:21] <shiftplusone> cut some holes in the box it came in. [10:33] <Encrypt> "Raspberry Pi overclocking failure"
[10:33] <Encrypt> It should have been "Playing with 12V on a Raspberry Pi"
[10:36] <shiftplusone> It's gone to a better place. [10:40] * shiftplusone thinks MY123 should be banned from approaching electronics. [10:41] <shiftplusone> hand them over to a loving home before you kill them. [10:43] <MY123> shiftplusone: Like the TV box of my ISP which has a unused quad-core Intel Atom without the support of a sleep mode. [10:43] <MY123> It uses as much as 10 Pis. [10:51] * shiftplusone hasn't had any anti-malware or anti-virus software detect anything in years that wasn't a false positive. [10:52] <shiftplusone> can't you disable it? [10:53] <MY123> shiftplusone: The system would cry every 5 minutes with a " Your system is insecure, enable Windows Defender or install your antivirus software"
[10:53] <shiftplusone> isn't there an 'I will manage the antivirus myself' option which stops all the nagging? [10:54] <shiftplusone> For those of you just tuning in, welcome to #badsecurityadvice. [11:11] <qubitnerd> where you the one who sent the last mail on the internals ML? [11:16] <shiftplusone> leio, say what now? [11:17] <shiftplusone> qubitnerd, +1 that man was a wizard. [11:18] <shiftplusone> leio, don't see anything of the sort in the scrollback. What do you mean? [11:22] <shiftplusone> qubitnerd, I came to the conclusion before any such access. Even now, I stay away from the internal docs. [11:24] <shiftplusone> leio, are you referring to the question about pkg-config and wayland? [11:25] <shiftplusone> I can probably sort out the pkg-config stuff, as that seems to be the direction my responsibilities are going. I think wayland is just shelved for now until there's more money to throw at it. [11:26] <shiftplusone> leio, sorry I didn't catch the question when you asked it. I was probably at an airport at the time and not paying attention. [11:29] <shiftplusone> ah k. Mind if I PM you? [11:49] <ShorTie> yeah, too 1000, most likely ShorTie itus, lol. [11:54] <bint> and why is it faster on the hdd? [12:05] <MY123> Triffid_Hunter: What does print 'uname -a'? [12:14] <Stephini> gahh. i installed LXDE so i could check out minecraft and now i cant even get lxde to close without a hassle. >.< nor can i figure out how to make it not auto boot. [12:19] <Stephini> ok didn't see disable lightdm but did figure out how to boot to console from raspi-config. :P thanx for making me think to check there. [12:30] <bint> whats the shutdown command again? [12:31] <Armand> If you need sudo, that is. [12:31] <ShorTie> hault i think works too, if you spell it right, lol. [12:31] <sivteck> poweroff is systemd right? [12:33] <leio> I have it from sysvinit. [13:03] <zlimvos> I have the most idiotic issue. Setup is rpi B+ (USB)->DAC(Pin)->stereo receiver. Everything works fine. When i turn off my stereo receiver, i get kernel errors, but then when i turn the receiver back on I get the same errors and DAC is not working. Only when i remove the USB between rpi and the DAC and put it back on, things start working again. [13:05] <Triffid_Hunter> sounds like it could be a ground loop issue perhaps? [13:09] <ShorTie> anybody know about triggerhappy and for what reason raspi-config uses it for ?? [13:24] <doerteDev> OHAI. does anyone here repeat from a lousy rtsp security camera box to $interwebz using a raspberry? [13:34] <ShorTie> oh well, guess raspi-config/triggerhappy is beyound my metal capacity right now with no /dev/input/event* present, lol. [14:00] <turtlehat> no particularly rpi-related; can i make the clipboard in x persist when i close the application where i copied something from closes? [14:33] <Armand> Before our wedding, it rained the WHOLE week..
[14:33] <Armand> The wedding day was supposed to be 70%+ chance of rain. [14:34] <Armand> There was barely a cloud in the sky, on the day. [14:34] <Armand> Following day, downpour! [15:27] <H__> GPIO question : why is the sleep in https://dpaste.de/K7Ui needed ? If I remove it the UP event triggers with the switch still pressed down. [15:29] <H__> Gadgetoid_: is this a hardware problem ? design choice ? normal issue ? How do people handle this period ? Is sleep the way ? [15:34] <H__> ozzzy: have you measured this bounce thingie on a scope too and does a resistor+capacitor fix it ? [15:34] <pksato> not only mechanical switch generate bounces. edges of square wave have similar phenomena. [15:38] <H__> you mean it bounces physically ?! [15:41] <pksato> rpi input have a schmitt trigger. [16:01] <aftrumpet> Has anyone here tried to use Adafruit's PiTFT with the Rasperry Pi 2? [16:12] <Sonny_Jim> Don't you just love it when your ISP reboots your modem? [16:13] <IT_Sean> Also, I am going to have to ask you to change your username, omfgtora. [16:13] <omfgtora> this is #spiceworks? [16:13] <IT_Sean> My request still stands. [16:14] <IT_Sean> Was it a forum mod, or an IRC channel staffer? [16:15] <IT_Sean> Okay, i'll speak with the other staffers, buty, for now, please remove the "f"
[16:17] <IT_Sean> om_gtora: I've spoken with our channel staffers, and any nic with "omfg" in it is not acceptable as per the channel language policy. THank you for changing it. [16:20] <om_gtora> okay, it just went from sorta pedantic to completely pedantic. i'm just gonna leave if the mods are gonna be like this. [16:21] <ShorTie> i try, lol. [16:21] <IT_Sean> Works for me. [16:22] <IT_Sean> MY123: when we see an issue, we address it. We may not catch every one. We are only humans, afterall. [16:23] <diffra> Was that satire? [16:32] <McBride36> IT_Sean, #spiceworks? Dune fan? [16:39] <MY123> A weird SD card flashing error. [16:42] <MY123> diffra: why ? [16:46] <diffra> "pad every input block with NULs to ibs-size; when used with block or unblock, pad with spaces rather than NULs"
[16:49] <aaa801> 62976 blocks (1968Mb) written. [17:04] <diffra> What are you compiling? [17:06] <leio> it seems a warning, not an error. [17:07] <Armand> Looks like fun..
[17:07] <aaa801> MY123: where is that tree on my box? [17:38] <WACOMalt_> diffra: is it able to have multiple windows open, but all are full screen? [17:38] <WACOMalt_> like overlapping and you just switch between them? [17:39] <WACOMalt_> or maybe each program would need to run in its own "workspace"
[17:39] <WACOMalt_> and there are keyboard shortcuts to switch between workspaces? [17:39] <WACOMalt_> basically this machine will be a music player and typewrite. that's it. [17:50] <Bebbzor> pretty expensive, then its maybe better to buy an display that works right out of the box? [17:50] <Bebbzor> or are all those display small? [17:53] <hinv> anybody do power measurements on the new Pi2? [18:15] <Giddles> can i run the b+ with an 1,2amp power 5v supply? 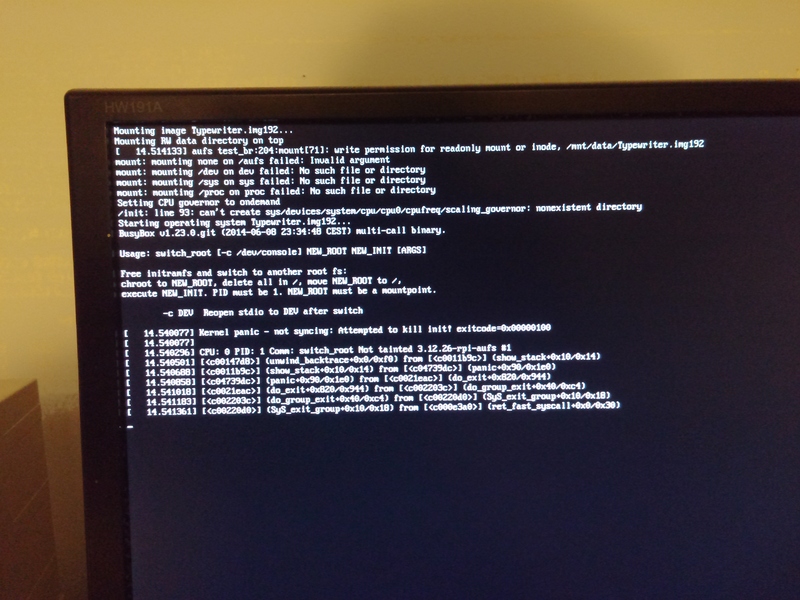 [18:24] <WACOMalt_> is it normal for BErryboot to freeze when cloning an OS? [18:24] <Bilby> foob- you've tried the raspi-config setting and the command line trigger? [18:27] <Bebbzor> Samsung MicroSDHC 8GB Class 6 is this good for the raspberry pi2 or should i go with class 10? [18:29] <WACOMalt_> does the Pi2 have the ethernet and USB on different busses? [18:29] <WACOMalt_> or are they still the same like on Pi B+? [18:34] <Bebbzor> rpi2 running xbmc/kodi is it ideally to have it wired or wireless with an Edimax EW-7811Un 150Mbps 11n Wi-Fi USB Adapter or something? [18:37] <SpeedEvil> Wired or wireless is unlikely to make very much difference. [18:38] <Bilby> foob- no worries. odd. [18:38] <Bebbzor> is heatsink for the processor needed? [18:40] <SpeedEvil> But it's in most cases not needed. [18:45] <McBride36> SpeedEvil, out of curiosity, why do you say blowing underneath the pcb instead of on top? [19:04] <Giddles> pbox at reichelt? [19:05] <day> that thing? is available at reichelt? [19:35] <Stellar_Mind> anyone know of a way to dynamically change a parameter using pressure as the independent variable? how do i input a pressure value as analog values? [19:40] <Stellar_Mind> I have both an Rpi and a mega. Whichever is easier to execute will be finally used. [19:41] <heller\> can someone give me pointers on the ADCPi? [19:48] <bynarie> are the model B and pi2 cases compatible? [19:50] <IT_Sean> Ah, that's what I was thinking of. [19:52] <IT_Sean> Aye, mine as well. [20:04] <day> thats what i just said?! [20:08] <PigFlu> Is anyone here familiar with making applications or GUI for the pi using QT? [20:08] <day> how is that pi specific? [20:09] <PigFlu> its not pi specific i guess..
[20:10] <WACOMalt_> is it possible to convert a berryboot disk image into a normal install? [20:11] <PigFlu> is it easy to cross compile? [20:14] <PigFlu> will there really be no difference? [20:16] <WACOMalt_> anyone in here have experience with i3 window manager? [20:16] <bynarie> PigFlu, what archs are u cross compiling for? [20:27] <_Trullo> where is the hd compatibitly list for the raspberry pi 2? [20:29] <_Trullo> is that list for the 1 or 2 version? [20:29] <_Trullo> or same problem with version 2? [20:30] <McBride36> anyone had bad experiences with kingston? [20:35] <Bilby> Does that flag play J-Pop while the OS is compiling? [22:00] <WACOMalt> Is there a chat channel for i3 window manager? [22:01] <PigFlu> when i run "startx" it just hangs on the error "FATAL: Module g2d_23 not found." [22:01] <IT_Sean> Have you tried asking a question in there, WACOMalt? [22:13] <WACOMalt> whats the built in wifi config gui program? [22:13] <WACOMalt> and is there any more straightforward (TV friendly) alternative? [22:18] <Bilby> What are you using? Kodi? [22:20] <PigFlu> how do i change the keyboard mapping? [22:27] <WACOMalt> ilso is there a good music player for pi that supports playlists and such and has a GUI? [22:27] <WACOMalt> like banshee or somesuch? [22:33] <WACOMalt> aaa801, do you think it will actually perform anywhere near usable even if you get it working? [22:33] <Sonny_Jim> What is ppsspp? [22:34] <WACOMalt> what is neon? [22:35] <PrinceProspero> Is anyone out there having their rpi2 power LED blinking? I purchased mine about a week ago and its been fine, but now I noticed that the red LED has started to blink. Does that indicate a power? Lack of current? [22:36] <WACOMalt> whats a good media player that does playlists and isnt as heavy as banshee? [22:36] <WACOMalt> aaa801, silly question, as you running an X server at all? [22:38] <WACOMalt> what power supply you using? [22:45] <Sonny_Jim> A USB keyboard that has it's own power? [22:47] <PrinceProspero> Well, the USB keyboard works as an USB hub as well, the Logitech G19. [22:49] <PrinceProspero> Is there any 'safe' way of checking if a mobile charger is faulty or not? [22:58] <Sonny_Jim> Have you run fsck? [22:59] <teclo-> what's going on ? [22:59] <Sonny_Jim> Is this a new card? [23:00] <Sonny_Jim> So you've used it before and not had issue? [23:01] <Sonny_Jim> Hmm ok, what sort of PSU are you using? [23:02] <aaa801> dont apple psus need a retarded handshake to get full ampage? [23:02] <Sonny_Jim> Have you tried a different cable? [23:03] <aberrant> would just lock up the system - no errors, nothing. [23:03] <Sonny_Jim> Do you have a multimeter? [23:04] <Sonny_Jim> Also, is this a Pi1 or a Pi2? [23:08] <teclo-> ok, where do I put the + and - probes ? [23:18] <ShorTie> not sure about desktop, checking the work in progress on that 1, lol. [23:19] <ShorTie> anybody boored and feel like playing with making a raspbian image on a pi for the pi ?? [23:21] <ali1234> can i run that not on a raspberry pi? [23:23] <ali1234> can you make it fetch the stuff by ssh? [23:23] <ShorTie> fetch stuff by ssh from your pi ?? [23:24] <ali1234> does it create an auto resizing image? [23:26] <ali1234> it's this "Adjust a few things section" right? [23:28] <ali1234> that's the only section that actually needs to run on the pi? [23:28] <ShorTie> i guess, kinda brian burned right now, lol. [23:35] <WACOMalt> Whats a good music play for Pi that simply shows drives and lets you make a playlist? [23:39] <brennen> WACOMalt: deadbeef, maybe? [23:39] <brennen> haven't used it in a while, but it was pretty lean. might be a build. [23:39] <WACOMalt> cool, I'll try it. thanks! [23:41] <Bilby> I suggest you cut the red wire. maybe. [23:42] <PigFlu> it's counting down as well.. about 2 minutes left. is this bad? [23:42] <shiftplusone> PigFlu, get a better power supply and/or cable. [23:45] <Bilby> so the pi is working but light is blinking?